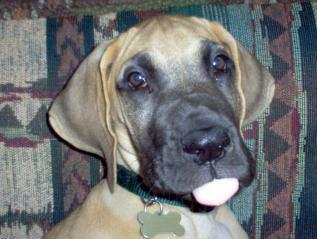 "The story of building a coop and keeping illegal chickens"
He was a beautiful fawn colored, 205 lb., well behaved great dane that we raised from a 12 week old puppy. The loss of him was one of the most terrible things we have gone through and we still miss him dearly. Side Note: He would have been great with the chickens and would have been their protector! At the end of March we ended up going to San Diego, CA for a week over Easter and experiencing the largest 7.2 earthquake they have had in 20 years! What a ride that was for two quiet mid-westererners. 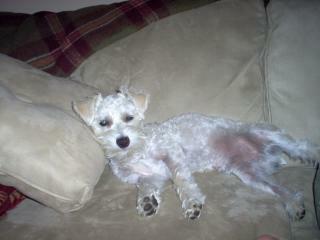 When we returned home we were jerked back to the reality that our Mac Daddy was really gone and we had two 10 lb. 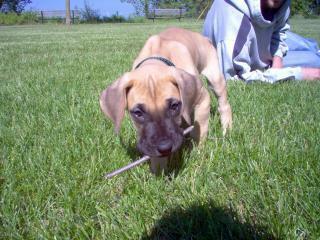 Carin Poos ( Chester and Rufus) that missed him more than we did. Both of us have wanted to move out of the city of Milwaukee, but now was not the time and chickens came up in conversation for some odd reason. We chit chatted a little about how we would want horses and chickens on a small farmette close to the city and how we should start canning food to save some money... when a storey rose out of the news about how a group of people from Milwaukee were trying to get chickens legalized in the city. Well...we both feel that the city should not be telling us what we can and cannot do in our own homes and yards...to a point. So we do it anyway!! Chicken adventure, here we come!! The Investigation Begins....Chickens eat what? The month of April in Milwaukee, WI can be either cold and wet or steamy hot...there is not anything in between lately. We looked on the internet and quickly found Backyard Chickens.com. The informatin there is incredible!! Coops, coops sizes and shapes , how many chickens should you have and what type, safe ways to treat your chickens for the creepy crawlies, how to manage poop properly, feeding, incubating (bating), OMG the list goes on and on! for a few weeks all we did was talk about chicken how were they to fit into our tiny garden. 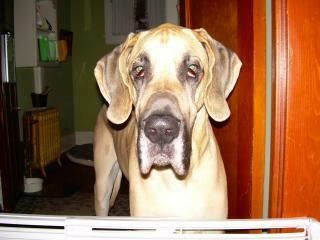 So lets go back a step to the great dane Mac Daddy, he was large and he needed yard space. We needed to reseed the entire lawn area every year as Mac Daddy pee was toxic to everything green. I am a natural plantaholic. 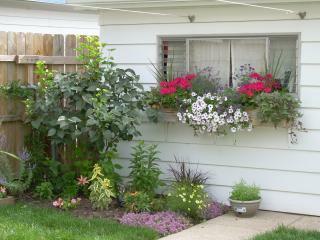 I was a professional horticulturalist and garden designer for 20 years. Seven years ago I decided to give it up to make more money....Realestate was my choice and I love it. I love plants too... We both do! 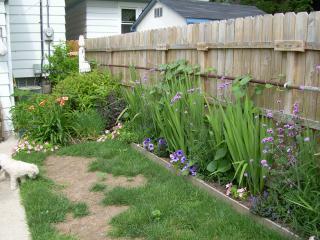 We loved our Mac Daddy, so most of our garden was devoted to lawn space for him and the other two dogs. Now that he is gone we could expand our gardens and plant, plant, plant. There is no excitement in this..as I type this months later I miss him even more. So up north we went...we packed up the dogs and brought a crate "just in case"! 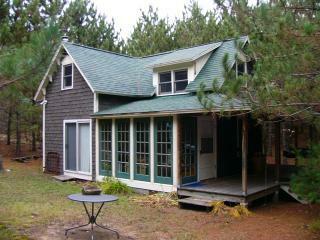 We had a great time in the peace and quiet at our little cabin in the woods. We talked about the chickens and that we should probably not get any on this trip as we had not even started our coop yet. We were so excited...this famer raises all kinds of fowl and birds!! WHOA! BIRDS! Problem #1: I have a terrible bird phobia! I mean like really bad. If a robin does a fly by of my head I will be indoors in a flash, if I so much as see or think I see a dead bird it makes me gag and shiver! If I had to choose the one thing that freaks me out the most it would be baby robins....just the thought of it right now makes me cringe. YUK! So, What do I do about this chicken thing? Never did I think that they were birds too. Until now I had only been thinking about chickens and how to care for them, house them and what BBQ sauce would be best to grill them with. Funny how I think a package of chicken bought at the store is in no way or ever was a living thing. It never dawned on me that it was a living bird at one time. Farmer Josh, that's what he introduced himself as, came right over to the truck, shook our hands and brought us right to the main gate of the chicken run. I didn't even have time to think about where we were about to enter... as soon as he closed the gate behind us I realized I was surrounded by birds. Chickens to be exact, little ones, big ones, turkeys and ducks. Then from inside a run down little shed the farmer pulled out a fluffy silkie hen. I was intimidated by this little 12 week old chicken, he had me hold it and it flapped it's boney wings and I closed my eyes and yelp to "take it away!". In the kennel it went without even so much as a peep...they were so quiet and docile. We ended up picking out four "hens", we will see if farmer Josh has the magic touch to be able to pick out boys and girls at this early stage! Then, just as I had calmed down and was thinking that these chicks were not so bad a loud an large sound came from behind me that made me jump right out of that chicken run. It ended up being a tom turkey with his feathers all puffed up and he was dragging his wing feathers on the ground. It sounded like a loud drumming sound, an attack sound! I thought...lets pay the man and get going before I change my mind! Well we made it through the first two weeks of taking care of chickens and getting them to trust our two little dogs...They all play happily in the yard together and sometimes when the dogs are sleeping in the grass the chickens will peck at things in their fur. 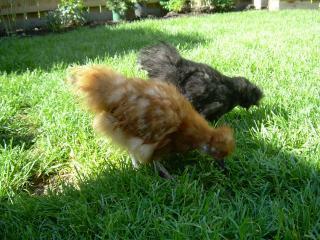 We also named those chickens! Since we had 4 chickens we thought the perfect names would be Rose, Blanche, Dorthy and Sophia....yes you guessed it, the "Golden Girls"! While at the cabin the weekend we bought the chickens we thought we were going to need something to house the chickens in temporarily. The cabin used to be run on a generator and since getting "real" electricity we have no use for a small generator box that we built some years ago. 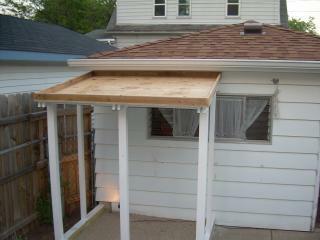 It was a 30" x 30" box with sloped roof that is removable ...perfect for temp housing, "lets bring it home". 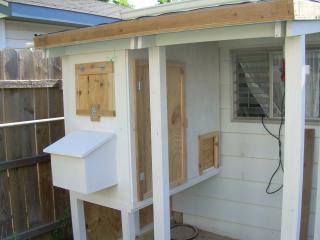 With a few modifications to the generator box it made a great first home for the girlz. 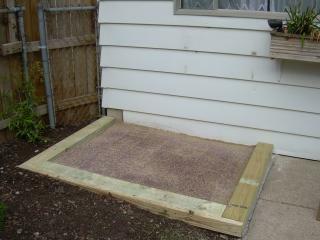 At first we had disscussed that the chicken run would be attached to the garage and the pop door would go through the garage siding into a hen house that would be in the garage. Garage gets hot in the sun!! How would we vent it to keep it cool? 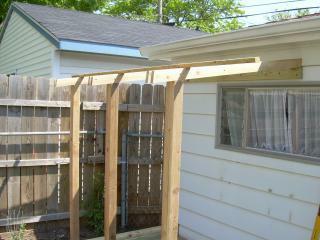 We could not come up with a good solution that we both liked so the plan was to keep the whole thing outside. 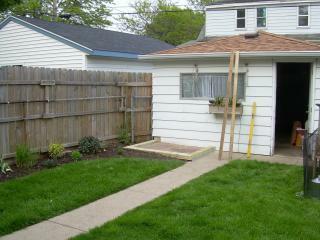 Before we could dig an area for the foundation we had to relocate a nice planting bed with a 6 foot lilac bush and other plants. We don't toss plants in this household...we dug up the lilac and the other plants and found them a new home. 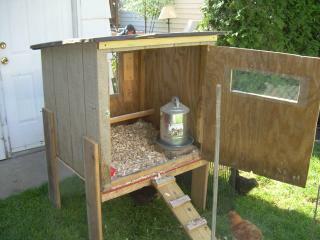 The planned size for the coop was dictated by the size of the area, which turned out was about 4'x6'. The more we talked the more ideas we got as to how it should look and how we wanted it to work based on what was learned on Backyard Chickens. 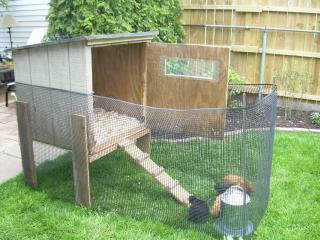 The idea came up that, since we are losing garden space, that maybe the coop and run should have a green roof. Not the color green, but a roof that has soil on the top and is planted with low growing plants. The green roof also has the benefit of keeping the inside of the hen house cooler in the summer and warmer in the winter. Great idea...more planning and reasearch for that one! 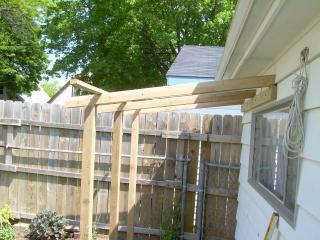 The foundation consists of 6'x6' treated timbers set almost level with the ground. The ground inside this foundation was dug out and filled three quarters full with lime chips and topped off with a 4" mixture of sand and pea gravel. This makes for a well draining run that should be easy to keep clean. The coop was built on top of this foundation and one of the four walls of the coop is the garage wall. 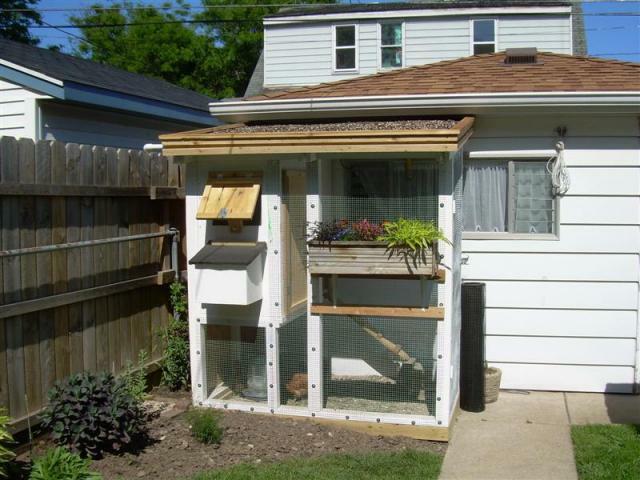 Cute coop but would be nice to have more pictures of the building process. Would love more pictures! 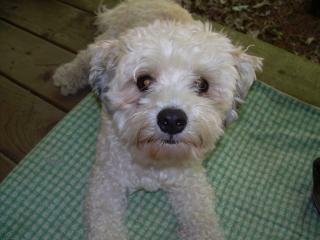 Beautiful dog.